Stereotactic body radiation therapy (SBRT) of the lung is a very effective technique for achieving local control in the initial stages of primary tumors and in patients with oligometastatic disease. In SBRT treatments, the fractions used range from 6 to 30 Gy per se ssion, and the planning target volumes (PTVs) are usually only a few centimeters in diameter. Dose distributions have a very steep gradient which is necessary to protect organs at risks. This type of treatment requires the use of special techniques to guarantee safety and efficiency. Radiochromic film is widely used in the quality control of conventional treatments. However, its utilization presents several difficulties mainly due to its response to scanning, the heterogenic nature of films and the method chosen for converting optical density maps to doses., On the other hand, the use of films is advantageous from a financial viewpoint since the initial cost is lower and the system is maintenance free; they have an electronic density equivalent to tissue and their response to radiation is isotropic; they can be modified to different sizes and shapes which allows them to be used in different phantoms, and their spatial resolution is greater than that of any detector array. The latter, however, is an important requisite for quality controls in SBRT treatments. In the available literature, no studies were found utilizing radiochromic film for verifying VMAT lung SBRT treatment plans reaching high doses of radiation and which also compare the results with an alternative measurement procedure. The aims of this research are to verify the use of radiochromic film for use in QA controls of VMAT lung SBRT treatment planning, and besides, compare these results with those obtained through an alternative method involving an ion chamber array. Totally, 14 patients treated through SBRT for primary and metastatic lung tumors were selected. Three dose fraction schedules were utilized: 8 sessions at 7.5 Gy, 5 sessions at 11 Gy, and 3 sessions at 18 Gy. PTV volumes ranged from 6.8 to 79.4 cm 3 and effective diameters were 2.4–6.1 cm. The patients were computed tomography (CT)-scanned in a Siemens Sensation Open CT, the slice thickness selected was 1.5 mm. The TPS utilized was Eclipse, version 10.0 (Varian, Palo Alto, CA, USA). Treatments consisted of two or four partial coplanar VMAT arcs, with the isocenter set at the geometric center of each PTV, using X-rays of 6 MV and a maximum dose (MD) rate of 600 monitor units (MUs) per minute. QA controls were performed in a Clinac-iX (Varian Medical Systems) linac, equipped with multileaf collimator Millenium-120. All VMAT plans were optimized using the progressive resolution optimizer 3 with the “Air cavity correction” option activated. Final dose calculation was performed using the analytical anisotropic algorithm and a 1.5 mm calculation grid. The phantom used for all measurements was OCTAVIUS (PTW, Freiburg, Germany). Transversally, it is octagonal with a length and diameter of 32 cm. In its central plane, there is a slot measuring 30 cm × 30 cm × 2.2 cm which allows various types of detectors to be inserted. QA plans were generated through the TPS using the same calculation grid as that of the treatment plan. The calculated dose plane was exported in absolute dose. Due to differences in geometry between patient and phantom, MD values did not coincide with prescribed doses. These ranged between 5.9 and 15.7 Gy within the comparison plane. The two-dimensional (2D)-array seven29 (PTW, Freiburg, Germany) consists of 729 cubic vented ion chambers with 0.5 cm × 0.5 cm cross-section and whose centers are 10 mm apart. Before every QA, two standard open fields were delivered, anteroposterior and posteroanterior, with known monitor units, to account for daily variations in linac output to be corrected. To increase spatial resolution, the merge method, included in the Verisoft software (PTW, Freiburg, Germany), was used for all cases. This consisted in combining four measurements, displacing the array 5 mm each time along the measurement plane. Using this method, the number of measurement points was multiplied by four, going from 729 to 2916, thus increasing spatial resolution to 5 mm. For the present research, one single batch of Gafchromic ® EBT3 (Ashland ISP Advanced Materials) film was used. Each film strip used measured 20 cm × 25 cm and came with no fiducial markers. According to the manufacturer's specifications, the film is composed of a 28-micra thick sensitive layer, sandwiched between two 120-micra thick layers of transparent polyester. This symmetric composition allows the film to be scanned on both sides indistinctly. However, the result is directionally dependent on the orientation of the film strip and the direction in which scanning is performed. This phenomenon is due to the elongated shape of the particles containing the active component whose longer axis was parallel to the shorter side of the film strip.,,,, As a result, the film strips were always scanned in the same direction such that the longer edge of the film strip was parallel to the scanning direction (landscape). The scanner used was an Epson 10000XL. Transmission images were obtained in RGB positive mode, with a depth of 16 bits per channel and a resolution of 72 dpi. Scanning was performed using the software provided by EPSON. All options for adjusting colors were deactivated so as to obtain uncompressed raw files in tiff format. To reduce noise, each film strip was scanned three consecutive times to thus obtain a mean. Subsequently, a 3 × 3 pixel Wiener filter was applied. A lack of lateral homogeneity is a well known trait of this scanner. This phenomenon is channel dependent, red channel being the most affected and becoming greater as the dose increases. Nonetheless, using multichannel dosimetry, no correction is required for such an effect, if the scan is performed in a central area of the scanner. For the scanner used in the present study, the width of this area is 14 cm for a dose of 20 Gy. Therefore, at a MD of 15.7 Gy, a film width of 10 cm and correctly centering the film strip, issues with lateral homogeneity are avoided. The scanner was switched on at least one hour before use. To stabilize its output, 5 blank scans were performed before scanning any film. where AK, BK, and CK are adjustment coefficients, thereby generating a calibration curve for each channel. To generate the calibration curve, first, the dose/MU ratio was obtained by inserting a PTW 30013 chamber in the OCTAVIUS phantom. The upper part of the phantom was replaced by 5 slabs of 1 cm-thick plastic (PTW RW3). Then, the phantom was centered with a source to detector distance of 100 cm. The energy used was 6 MV X-rays, and the delivery field measured 20 cm × 20 cm. To calibrate, a film strip was cut into twelve pieces measuring 2 cm × 20 cm. Subsequently, each piece was irradiated using the same setup, in the center of the irradiated field. The dose delivered to each piece was from 0 to 16 Gy. Following this, all the pieces of film were scanned together. This calibration procedure must be performed for each batch of film. In film dosimetry, the uncertainties stemming from factors such as variations in accelerator output or scanner response must be corrected. To this end, the procedure proposed by Lewis et al. was applied. Thus, for each QA, the use of three pieces of film is proposed: one for irradiating according to the treatment plan, another “reference” piece irradiated with a known dose, and a third film was not irradiated. The three pieces are then processed in the same scan. Thus, the previously obtained calibration curves can be linearly corrected. In the present study, given the small PTV size, each film strip was cut in half lengthwise, thus making two pieces measuring 10 cm × 25 cm. Each of these halves was sufficient for QA testing. These were then cut into three pieces: one measuring 10 cm × 20 cm for the treatment plan QA, and two measuring 10 cm × 2.5 cm, one of which was used as a reference and the other remained without being irradiated. The reference piece was irradiated with a dose equaling the MD value of the verification plane. To eliminate post-irradiation developing influence, scanning was performed following a delay equal to or greater than four-fold the time passing between the moment the reference piece was irradiated and that of the QA. 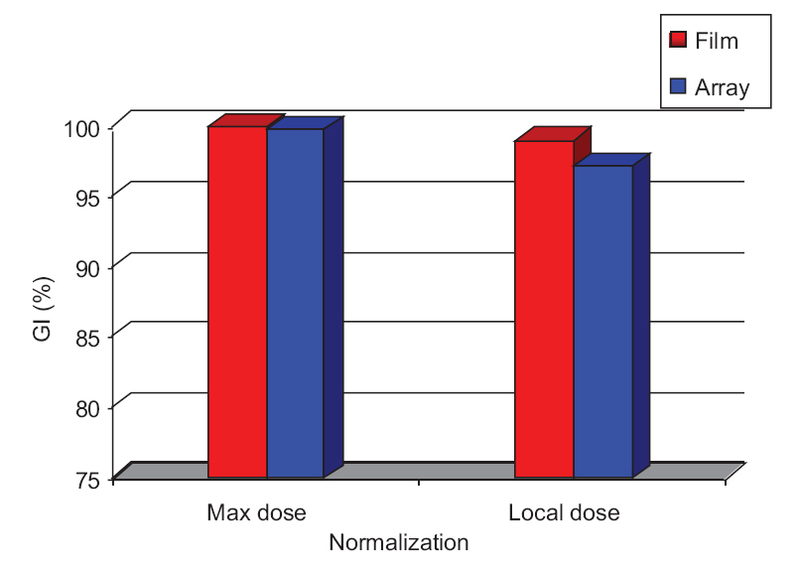 The dose distribution was calculated through a routine adapted in Matlab version 8.2. (Mathworks, Natick, MA, USA). The routine is based on the formalism developed by Mayer et al. For each color channel, a first order Taylor expansion is applied to include a perturbation; the difference between this perturbed dose and the true dose generates a cost function that has to be minimized. As said above, the daily dose correction consists essentially the use of normalized calibration curves, corrected using the reference, and the zero dose films. This was proposed by Lewis et al. As a result, a tiff file is generated for comparison with the TPS dose plane. The TPS-generated dose distributions for the OCTAVIUS phantom were compared with the experimental values from the array and from the film through gamma analysis. Three passing criteria were used: 3%/3 mm, 3%/1.5 mm, and 2%/2 mm, with the threshold set at 10% of the MD. 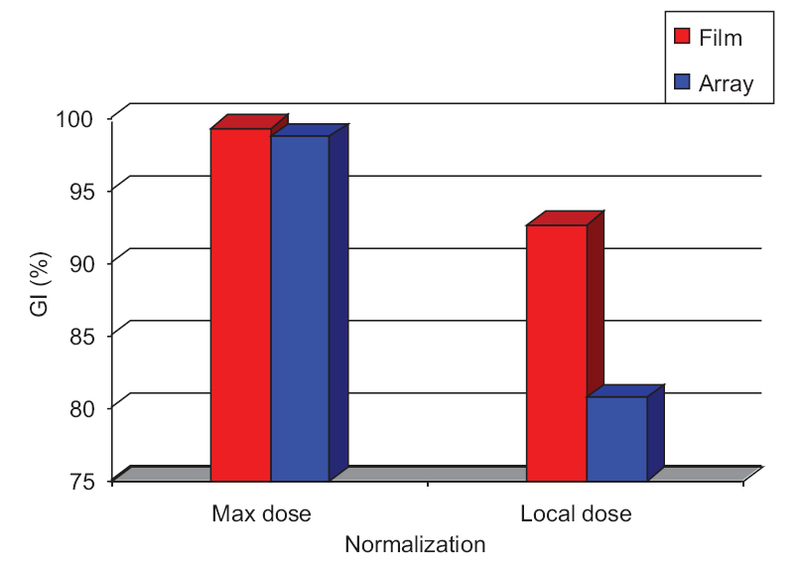 Both MD and local dose (LD) were used for normalization. The gamma passing rate (GPR) (percentage of points presenting a gamma function value of <1) was obtained using the Verisoft (PTW) software. These criteria have been chosen to compare with most of the available literature and to test the behavior of the two methods with increasingly restrictive criteria. The GPR values obtained for both detectors were compared for each gamma criterion. The non-parametric Wilcoxon signed-rank test was calculated using the SPSS (IBM, Inc., Chicago, Illinois, USA) software. The difference was considered statistically significant when P < 0.05. For each procedure, the times for both linac operation and data analysis were measured, and the procedure taking the lower time was considered the most efficient. 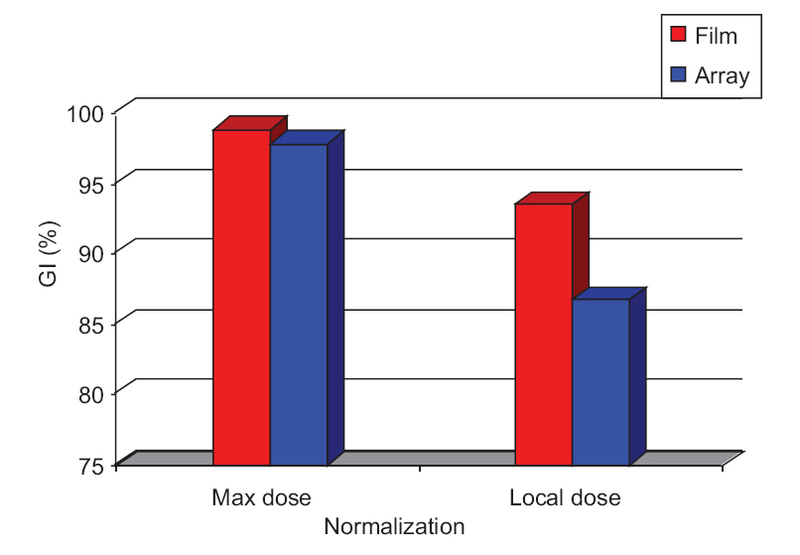 The calibration curves obtained cover the entire dose range (this is, from zero to the highest dose of the distributions generated by the TPS) without the need for extrapolation. [Figure 1] presents the calibration curves. The adjustment for all three channels showed correlation coefficients >0.999. [Table 1] shows a summary of the results obtained. For each procedure, the mean GPR value is shown with its standard deviation, and the maximum and minimum GPR values obtained for each criterion. With regard to the array, the mean GPR for the 3%/3 mm criterion was 99.8% with MD normalization and 97.2% with LD. The mean GPR for 2%/2 mm was 97.8% with MD and 86.8% with LD. For 3%/1.5 mm, it was 98.8% with MD and 80.7% with LD. Regarding the film, for the 3%/3 mm criterion, the mean GPR was 100% with MD normalization for all plans and with LD, the mean GPR reached was 99.1%. For the 2%/2 mm criterion, the mean GPR was 98.8% with MD normalization and 93.5% with LD. For 3%/1.5 mm, it was 99.3% with MD and 92.7% with LD. When using film, GPR means greater than 90% were obtained for 12 plans with the criteria of 2%/2 mm/LD and 3%/1.5 mm/LD. On using the array, the 2%/2 mm/LD criteria gave a mean GPR >90% for 6 plans, as did the 3%/1.5 mm/LD criteria for 2 plans. [Figure 2],[Figure 3],[Figure 4] show the relationship between the results obtained through both procedures for each criterion. [Figure 5] shows the following for the highest dose delivery QA (15.7 Gy): (a) Gamma function distribution maps corresponding to the array, for both 3%/1.5 mm and 2%/2 mm criteria, with LD normalization. (b) Idem for film. (c) Isodose distributions as measured through array (thick lines) compared with those calculated through TPS (thin lines). (d) Idem for film. This QA resulted in mean GPRs for the array of 70.1% and 65.2% at 2%/2 mm/LD and 3%/1.5 mm/LD, respectively. For the film, these were 96.9% and 97.3%, respectively. When applying the aforementioned criteria, respectively, yet normalizing per MD, the mean GPR was: 98.5% and 96.8% for the array and 99.5% and 99.9% for the film. In the case of the array, as can be observed in the gamma distribution maps [Figure 5]a and [Figure 5]b, the more extensive areas with gamma values >1 are located in medium to low-dose zones. Thus, using MD for normalization, these areas have a much lower gamma value and mean GPRs improve considerably, reaching very high GPRs for both detectors. [Table 2] shows the percentage point differences between mean GPRs obtained for each gamma criterion and the resultant P value, according to each procedure. The test utilized showed statistically significant differences (P < 0.05) between GPR values for both methods when analyzed according to LD and yet, no statistical significance was found with regard to MD. The variation in GPR for LD normalization is greater the more restrictive the criteria. Thus, for the 3%/1.5 mm criterion, the difference in favor of films is 12% (92.7% for film vs. 80.7% for array), whereas, for less stringent gamma criteria, such as 3%/3 mm and 2%/2 mm, the differences are 1.9% and 6.8%, respectively. The linac operation time required for the QA test with the array was 55 min; for film, it was 30 min. The analysis of measurements required 5 min for the array and 15 min for the film. This analysis can be made immediately after the measuring procedure for the array; for film, data analysis must include a time delay of 4T, T being the time between the moment the reference piece was irradiated and that of the QA. In practice, T is approximately 10–12 min, so, there must be a wait of at least 1 h after irradiation. Two alternative methods were compared for performing QA controls before lung SBRT treatment of patients. 14 treatment plans were verified using 2D-Array seven29 and EBT3 radiochromic film, in an OCTAVIUS phantom, with doses from 7.5 to 18 Gy per se ssion. The mean GPR obtained using a 2D-array are comparable to those obtained by other authors in similar studies using the same detector.,, Chandraraj et al. describe a mean GPR of 96.4% for 15 VMAT plans over a range of locations for a gamma criterion of 3%/3 mm and MD normalization with a threshold of 20%. On the other hand, Stathakis et al. improved the spatial resolution of the 2D-array in a series of 36 SBRT treatment plans delivered through IMRT, by increasing the source-detector distance to 215 cm; in this way, the resolution is similar to that achieved through the merge method, however, it does not allow adequate verification of VMAT planning since it requires the gantry angle remain at zero degrees. Nonetheless, the mean GPR values reached were 99.6% for a criterion of 3%/3 mm and 95.9 for 2%/2 mm, both normalized per MD. Weyh et al. verified 8 VMAT lung SBRT plans with a 2D-array, a gamma criterion of 3%/3 mm and normalization at MD, for which a mean GPR of 99.6% was obtained. In the present study, using the same criterion and device, a mean GPR of 99.8% was achieved. In the present study, to increase the resolution, the multiple acquisition method was applied using the merge algorithm. Given that the PTVs studied were small, such improvements in resolution are recommended. Similarly, in a number of studies, the 2%/2 mm criterion was considered more appropriate than the 3%/3 mm one.,,, For head and neck plans, as well as for prostate, Stasi et al. used the 2%/2 mm/LD criterion and obtained a mean GPR of 89.4% and 85.0%, respectively, while in the present study, the result obtained was 86.8%. Nalbant et al. compared the 2D-array seven29 with the EBT3 film in a study involving 10 prostate IMRT treatment plans. The array, with a criterion of 3%/3 mm/MD, gave a mean GPR of 95.9% while the film gave 92.6%, whereby the array showed a better resultant GPR. Hussein et al. made a comparison of various devices, including the 2D-array seven29 and radiochromic EBT2 film in a study involving 22 VMAT and IMRT treatment plans. Mean GPRs were identical for both array and film with a criterion of 3%/3 mm/MD; the film gave better results for the 2%/2 mm/MD criterion (91.1%, as opposed to 90% for the array) although this does not reach statistical significance. The results of the present study showed no significant differences between both measurement methods when performing the gamma analysis with MD normalization; however, when using LD normalization, the difference is statistically significant for all three criteria, reaching a difference of 12% for 3%/1.5 mm/LD. It is worthy of note that in the studies quoted previously, the doses measured correspond to standard fractions of 2 Gy/fraction. Studies exist in which the dose value is increased significantly. Siva et al. used the EBT2 film to verify a dose of 26 Gy in a single fraction, delivered through a conformal static field technique. To do so, the prescription was modified such that a dose of 5.6 Gy was delivered to the film. This procedure is not possible with VMAT treatments since such a large dose scaling is not allowed without performing optimization. Cusumano et al. extended the calibration of film to 8 Gy, for verifying Cyberknife treatments of intracranial lesions. With a criterion of 5%/1 mm/MD, a mean GPR of 94.3% was obtained for a sample of 13 patients. These results are somewhat poorer than those of the present study, probably due to problems stemming from the use of polynomial functions for generating calibration curves. Palmer et al. used EBT3 film for measurements in a nonclinical plan for testing with a MD of 25 Gy. Using the multichannel dosimetry method, a mean GPR of 63.7% was obtained for a criterion of 3%/1.5 mm using MD normalization and 45.0% with LD normalization. In the study hereby presented, 15.7 Gy was reached in the case of the radiochromic film, thus obtaining a GPR of 99.9% for a criterion of 3%/1.5 mm with MD normalization and 97.3% for 3%/1.5 mm/LD. Regarding spatial resolution, the present study reveals a resolution of 0.35 mm for the radiochromic film, which translates to approximately 3 points/mm. The resolution for the array, even using the multiple acquisitions method, finally reached 5 mm. In this context, we would consider the use of the radiochromic film more appropriate for verifying SBRT treatments. Finally, this procedure required 30 min of linac operation time when utilizing the radiochromic film while for the ion chamber array, the time required was 55 min. When having to perform various consecutive QA tests, this time increased considerably. This is mainly due to the fact that the array requires four measurements for each plan, although there are other detector arrays with a greater resolution which only require a single measurement.,, Furthermore, the analysis time was greater for the film, given the time required for scanning and obtaining the dose distribution through Matlab. For most radiotherapy institutions, the linac operation time is usually a limiting factor, both for the treatment of patients as for QA procedures, and as such we consider the film to be the most efficient method. Thus, it has been verified that both the 2D-array seven29 ion chamber array using the merge method and the EBT3 radiochromic film, used in conjunction with the OCTAVIUS phantom, are methods providing satisfactory results for the QA testing of VMAT lung SBRT treatment plans. The EBT3 film provided better GPR than the 2D-array, particularly when the more restrictive criteria of 2%/2 mm/LD and 3%/1.5 mm/LD were utilized. Furthermore, its spatial resolution and overall procedural efficiency are greater. As such, film dosimetry is the chosen method for verifying planar doses during QA testing of VMAT lung SBRT treatments at our center. Ong CL, Verbakel WF, Dahele M, Cuijpers JP, Slotman BJ, Senan S. Fast arc delivery for stereotactic body radiotherapy of vertebral and lung tumors. Int J Radiat Oncol Biol Phys 2012;83:e137-43. Narayanasamy G, Granatowicz D, Baacke D, Li Y, Gutierrez A, Papanikolaou N, et al. Comparison between three-dimensional conformal radiotherapy, intensity-modulated radiotherapy, and volumetric-modulated arc therapy techniques for stereotactic body radiotherapy of lung tumors. Int J Med Phys Clin Eng Radiat Oncol 2015;4:104. Nelms BE, Ehler E, Bragg H, Tomé WA. Quality assurance device for four-dimensional IMRT or SBRT and respiratory gating using patient-specific intrafraction motion kernels. J Appl Clin Med Phys 2007;8:2683. Abdellatif A, Gaede S. Control point analysis comparison for 3 different treatment planning and delivery complexity levels using a commercial 3-dimensional diode array. Med Dosim 2014;39:174-9. McGarry CK, O'Connell BF, Grattan MW, Agnew CE, Irvine DM, Hounsell AR. Octavius 4D characterization for flattened and flattening filter free rotational deliveries. Med Phys 2013;40:91707. Devic S, Tomic N, Lewis D. Reference radiochromic film dosimetry: Review of technical aspects. Phys Med 2016;32:541-56. Mizuno H, Takahashi Y, Tanaka A, Hirayama T, Yamaguchi T, Katou H, et al. Homogeneity of GAFCHROMIC EBT2 film among different lot numbers. J Appl Clin Med Phys 2012;13:3763. Kan MW, Leung LH, Yu PK. The performance of the progressive resolution optimizer (PRO) for RapidArc planning in targets with low-density media. J Appl Clin Med Phys 2013;14:4382. Van Esch A, Clermont C, Devillers M, Iori M, Huyskens DP. On-line quality assurance of rotational radiotherapy treatment delivery by means of a 2D ion chamber array and the Octavius phantom. Med Phys 2007;34:3825-37. Poppe B, Blechschmidt A, Djouguela A, Kollhoff R, Rubach A, Willborn KC, et al. Two-dimensional ionization chamber arrays for IMRT plan verification. Med Phys 2006;33:1005-15. 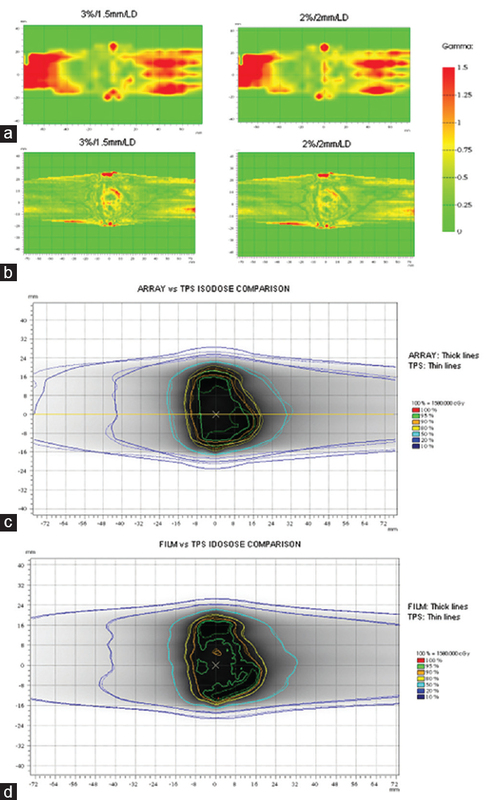 Serna A, Mata F, Puchades V. Establishing an optimized patient-specific verification program for volumetric modulated arc therapy. Med Dosim 2013;38:274-9. Spezi E, Angelini AL, Ferri A. A multiple acquisition sequence for IMRT verification with a 2D ion chamber array. Med Dosim 2006;31:269-72. Butson MJ, Cheung T, Yu PK. Scanning orientation effects on Gafchromic EBT film dosimetry. Australas Phys Eng Sci Med 2006;29:281-4. Lynch BD, Kozelka J, Ranade MK, Li JG, Simon WE, Dempsey JF. Important considerations for radiochromic film dosimetry with flatbed CCD scanners and EBT GAFCHROMIC film. Med Phys 2006;33:4551-6. Ferreira BC, Lopes MC, Capela M. Evaluation of an Epson flatbed scanner to read Gafchromic EBT films for radiation dosimetry. Phys Med Biol 2009;54:1073-85. Menegotti L, Delana A, Martignano A. Radiochromic film dosimetry with flatbed scanners: A fast and accurate method for dose calibration and uniformity correction with single film exposure. Med Phys 2008;35:3078-85. Micke A, Lewis DF, Yu X. Multichannel film dosimetry with nonuniformity correction. Med Phys 2011;38:2523-34. Lewis DF., Practical Guide to Radiochromic Film EBT2/EBT3. Available from: http://www.filmqapro.com/Documents/Lewis%20-%20Europe%2011-2011.pdf. [Last accessed on 2016 Apr 10]. Mayer RR, Ma F, Chen Y, Miller RI, Belard A, McDonough J, et al. Enhanced dosimetry procedures and assessment for EBT2 radiochromic film. Med Phys 2012;39:2147-55. Lewis D, Micke A, Yu X, Chan MF. An efficient protocol for radiochromic film dosimetry combining calibration and measurement in a single scan. Med Phys 2012;39:6339-50. Chandraraj V, Stathakis S, Manickam R, Esquivel C, Supe SS, Papanikolaou N. Comparison of four commercial devices for RapidArc and sliding window IMRT QA. J Appl Clin Med Phys 2011;12:3367. Stathakis S, Mavroidis P, Narayanasamy G, Markovic M, Myers P, Papanikolaou N. Stereotactic body radiation therapy patient specific quality assurance using a two-dimensional array at extended source to surface distance. J BUON 2015;20:1154-63. Stasi M, Bresciani S, Miranti A, Maggio A, Sapino V, Gabriele P. Pretreatment patient-specific IMRT quality assurance: A correlation study between gamma index and patient clinical dose volume histogram. Med Phys 2012;39:7626-34. Marrazzo L, Zani M, Pallotta S, Arilli C, Casati M, Compagnucci A, et al. GafChromic(®) EBT3 films for patient specific IMRT QA using a multichannel approach. Phys Med 2015;31:1035-42. Pérez Azorín JF, Ramos García LI, Martí-Climent JM. A method for multichannel dosimetry with EBT3 radiochromic films. Med Phys 2014;41:62101. Nalbant N, Kesen D, Hatice B. Pre-treatment dose verification of IMRT using gafchromic EBT3 film and 2D array. J Nucl Med Radiat Ther 2014;5:182. Siva S, Chesson B, Aarons Y, Clements N, Kron T, MacManus M, et al. Implementation of a lung radiosurgery program: Technical considerations and quality assurance in an Australian institution. J Med Imaging Radiat Oncol 2012;56:354-61. Cusumano D, Fumagalli ML, Marchetti M, Fariselli L, De Martin E. Dosimetric verification of stereotactic radiosurgery/stereotactic radiotherapy dose distributions using Gafchromic EBT3. Med Dosim 2015;40:226-31. Palmer AL, Dimitriadis A, Nisbet A, Clark CH. Evaluation of Gafchromic EBT-XD film, with comparison to EBT3 film, and application in high dose radiotherapy verification. Phys Med Biol 2015;60:8741-52. Li G, Zhang Y, Jiang X, Bai S, Peng G, Wu K, et al. Evaluation of the ArcCHECK QA system for IMRT and VMAT verification. Phys Med 2013;29:295-303. Van Esch A, Basta K, Evrard M, Ghislain M, Sergent F, Huyskens DP. The Octavius1500 2D ion chamber array and its associated phantoms: Dosimetric characterization of a new prototype. Med Phys 2014;41:091708. Poppe B, Stelljes TS, Looe HK, Chofor N, Harder D, Willborn K. Performance parameters of a liquid filled ionization chamber array. Med Phys 2013;40:82106.